I sat down with jewelry maven Eliza Higgins to discuss all things Brinker & Lou! 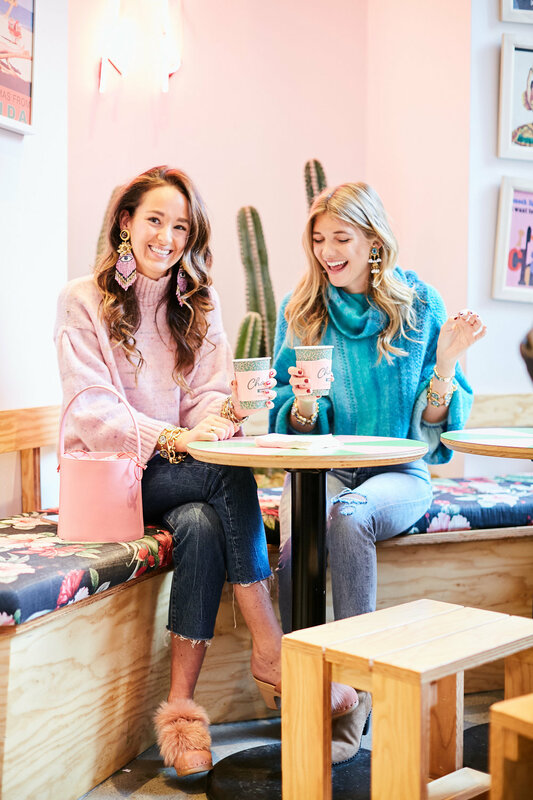 Eliza not only makes the dopest baubles, she is also a fellow blogger babe and the fashion director at Rebecca Minkoff... talk about a total BOSS am I right!? Read below for the full interview. My mom and I have been working together creatively for years. It began early on in my childhood with decorating ski helmets and barrettes and evolved into customizing denim jackets and jewels. We have been artistically inspiring each other and creating jewelry for the past 15 years (over half of my life!) and are thrilled to share a little piece of our passion with others through the launch of Brinker & Lou! Was there a particular moment that made you realize this career was for you? Have you always been interested in jewelry design? My mom has been designing jewelry for what feels like forever and we have been collaborating since day one. It’s really how I came to learn so much about jewelry and what guided me to a career in fashion. Her jewelry is so unique and so many people have always asked me “Where did you get that! ?” But there has never been an online shop to direct them to — until Brinker & Lou! What was the inspiration behind your Brinker & Lou? How did you come up with the idea? I actually went to a speaker series on women empowerment. It was all about women going after their dreams in their careers and not letting anything or anyone hold them back. That’s when it really hit me - it was a total light bulb moment. Later I was actually shocked that I hadn’t thought of it earlier. It’s like, of course there can be a place for people to buy the jewelry online – I have a website! I think that one of the reasons that I hadn’t given much thought to, or really pushed myself to, launch Brinker & Lou with my mom is because of the thoughts: What if it doesn’t work? What if nobody likes it? And really, if that’s the worst case scenario then I was the only thing holding me back. So we just went for it! It has been a huge learning experience and has required many late nights and long hours, but it has also been the most amazingly rewarding experience. What makes your approach different than other jewelry designers out there? My mom really is a wizard. I will go to her with an idea or something that I’ve been really feeling for. And the next time I see her she will have created something so much cooler than anything I could have imagined. She always takes it to the next level. Our second collection - the Spring/Summer 2018 line - will be launching on our site over the next two weeks! It’s all about the product for us. We try to make the best possible product that we want to wear day in and day out. And seeing other people wear it - and love it - is pretty darn cool!